The Dakota Gold quilt block is a five patch style block, so that makes the math easy. 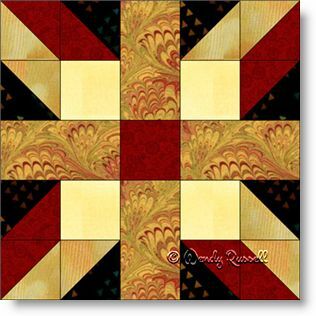 It contains only simple patches -- squares, rectangles and half square triangles -- which as you probably already know -- are the first pieced patches you learn as a beginner quiltmaker. The two sample quilts illustrated both use on point quilt block settings, but you will notice that they look very different. There are all sorts of different possibilities in the quilt layout. All it takes is a different set of eyes making the design. Enjoy!